Gardens are areas that are well watched, and many people are very interested in the birds that are around their garden and encourage the birds by providing additional food and clean water. Wire mesh peanut feeders, seed feeders, and bird tables are all commonly used. The Royal Society for the Protection of Birds and the British Trust for Ornithology both recommend that wild birds are fed all year round to enhance their success rates during the breeding season. However there are concerns when a large number of birds are attracted into an area to feed. One is the increased danger of the spread of disease. One such disease is caused by a trichomonas parasite. This disease had previously been known in pigeons and game birds, and in the summer of 2005 it started to be reported in finch species and sparrows in gardens in the UK. 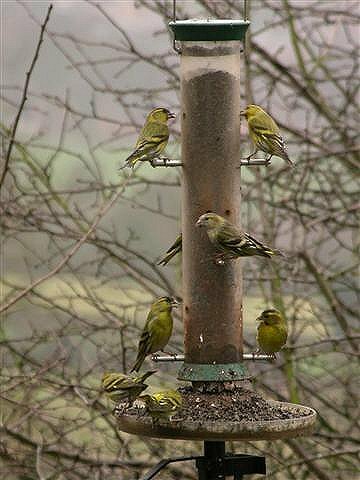 On Arran this summer there have been some reports of deaths of Chaffinches and Greenfinches at feeders. This disease does not pose a threat to the health of humans, cats, or dogs. Birds with the disease show signs of general illness, for example lethargy and fluffed-up plumage, but affected birds may also drool saliva, regurgitate food, have difficulty in swallowing or show laboured breathing. Infected birds are frequently seen to have matted wet plumage around the face and beak. In some cases, swelling of the neck may be visible from a distance. The disease is characterised by thickening and ulceration of the oesphagus and crop; it can progress to complete obstruction of the upper digestive tract. The parasite cannot survive for long periods outside of the infected bird. Transmission of infection between birds is most likely to be by birds feeding one another with regurgitated food during the breeding season; through food or drinking water contaminated with recently regurgitated saliva; or possibly from droppings of an infected bird. If birds at feeders show these symptoms, it is recommended to stop putting out food for at least a month. This will help to disperse the feeding birds and with it reduce the contact between sick and healthy individuals, thus slowing down or halting the outbreak.